Spent the afternoon wandering around the Shapwick part of the Somerset Levels today. The end of November weather was a bonus, not a breath of wind and in mid afternoon sunshine 12 degrees warm. Julie and I began with a coffee at Eco Bites near Shapwick, we love it here as to the birds, this 'Christmas' robin and a sociable reed bunting. After this, it was onto Shapwick Heath and marvelling at the sublime reflections in a still almost mirror like water atmosphere. This is not upside down - the water was that mirror like. I got Julie to lob a stone in here to add the circle ripples to an otherwise perfect reflection. By 4pm we were in Meare Heath hide and watching the starlings flood past. Everyone else was elsewhere, we seemed to have the place to ourselves. By the time this heron arrived the light was shocking but whacking up the ISO I managed a final reflection shot. We left the hide at 4.30pm and walked back through the woodland to the car. Such an atmospheric walk and allowed us to reflect on the day. 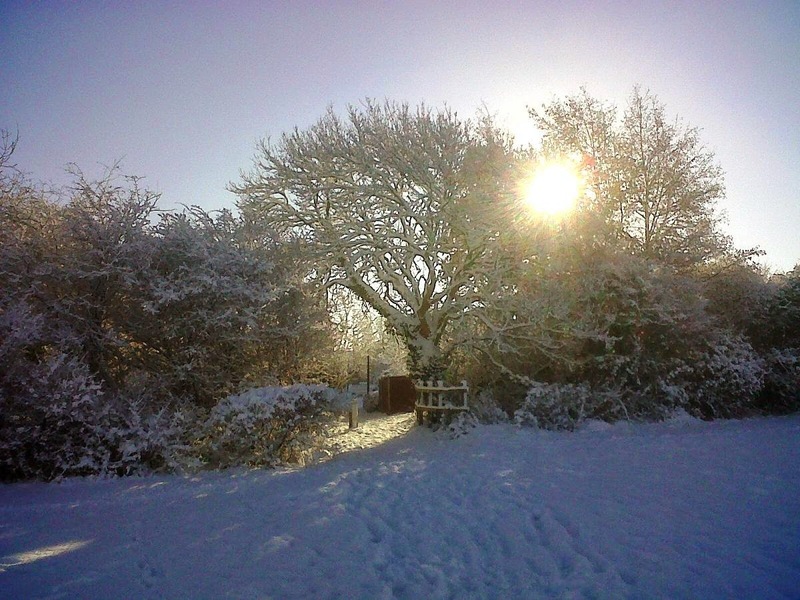 "Tracks led everywhere on the tell-tale white mantle of snow. The roe, the rabbit, the fox and the hare had left their stains. The spoor of pheasant, woodcock and blackbird marked the surface where they had striven for sustenance beneath the snow-covered earth. Below a holly bush, where snow had not penetrated, the tiny wren, his tail cocked upright, flitted about amongst the leafy carpet. At the eastern end of Blackburn Lake the leafless silver birches stood out against the white background like witches' brooms"
So wrote Henry Tegner (1901-1980) in 1953 in his story of a roe deer, The Buck of Lordenshaw. Henry Tegner was writer, naturalist and a deer expert; president of the Deer Society, firstly gaining his knowledge of deer in Dorset before later later moving to Northumberland. Here he continued his work from the village of Whalton near Morpeth. He wrote 25 or so books, primarily centred around the Northumbrian landscape and the wildlife that it contained. The Buck of Lordenshaw is as far as I'm aware the only life-story of a deer that has been published. His description is as mesmerising and evocative as other more familiar works about a single species, such as Tarka the Otter and yet this life and death struggle of a roe deer in and around the Cragside Estate near Rothbury is largely forgotten. As is this wonderful author. I have a first edition copy of that book next to me as I write, and flicking through the pages I am drawn back again to that part of remote Northumberland. This week in Somerset winter has finally showed it's first fingertip grip on a mild autumn, a light frost covered the fields. December next week yet snow, significant snow, seems far off. However Tengers words on the page I am looking at, transport me back to an often taken woodland walk in winter. "Silence reigned over Cragside save for the soft whisper of the snow as it fell upon the fir tree... It intensified the boundless silence of the whole countryside". It is a silence I remember fondly and hope to relive again this winter. Many is the time I have walked in the winter wood. Snow knee deep at the woodland edge slowly thins as I push forward past long dead summer vegetation into the corral of trees around me, into a silent world. Is the countryside silent? Muffled maybe. Snow provides the silence of the wild, save for the crepe and scrunch of boot on snow, a tactile satisfying sound no other substrate can mimic. Tread gently and my foot silently sinks into the opaque void, but, apply a little pressure, and the tell tale crepe of compressed flakes brings joy to my activity. Crepe, crepe, crepe my footfall softened. I hear my breath leaving me, billowing in a condensed cloud as I move. I am removed from the ground I walk over, soft snow obliterates form and shape, all is uniform, all is silent. I stop and listen. Nothing but silence. Nothing but the thick curtain of trunk and branch, dark against the pale sun bleached winter sky. The dark wood is silently observing me, and at leisure for the first warming rays of April sun. Then these woods which now sleep a deep midwinter's sleep will awaken to spring's choral, the willow warbler, the pied flycatcher, the chiffchaff and redstart will jostle for song borne soundscape. Today though I am remembering the joy of a wood in winter, I revisit to a silent world, lost in thought, my stride is measured and steady. Lost in my own thoughts, time stands still, yet it has begun to snow, softly. Single flakes breakthrough the canopy mesh to float silently and alone to the woodland floor. I watch them, spinning in unison before being absorbed into the snow-mass within. Without, a heavy fall has begun, dark clouds against the white landscape, swirling flakes coating the trunks of the outermost trees. But, inside the womb like cavern of a winter wood, single flakes gentle fall, in silence. I catch one in my gloved hand. So light, so delicate yet in a moment it is gone, returned to its liquid state by my internal heat. Light is fading now, I retrace and make my return across the fields. Illuminated from below, the landscape has a pearlescence to it, unique to a winter snowfall. Even indoors the radiance of light from below adds a glow to a room that even without looking will confirm that indeed snow has fallen overnight. That terra firma pale glow extends dusk well beyond its scheduled timeframe. A buttermilk glow may further brighten the west sky. No torch is required to light my way home today. 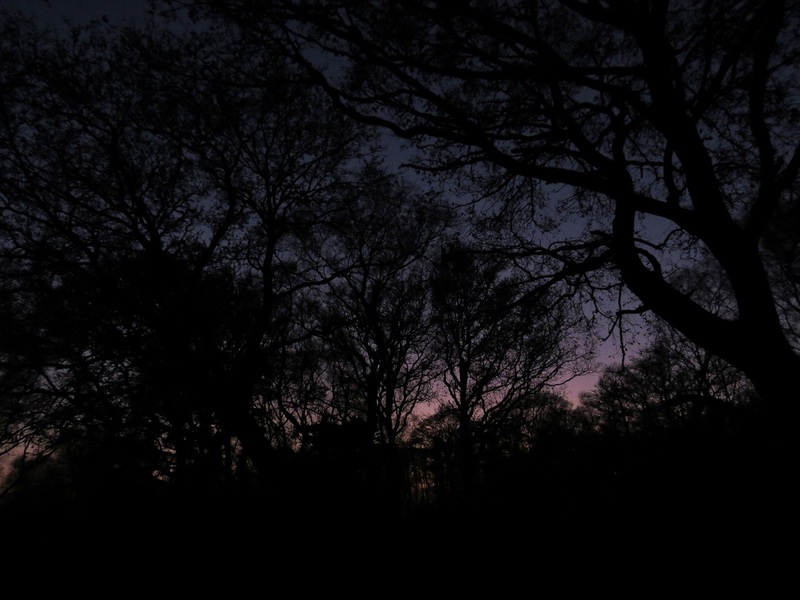 Trees silhouetted against the fading light stand isolated in the white of a countryside at sleep. Maybe a robin will break my reverie as the smoke of a cottage fire drifts listlessly up into the falling flakes. The pheasant metallic nasal call likewise drifts from some unseen hedge, it is a sound of winter to me. The countryside is closing down for the day. Along the field I walk, my face both hot and chilled with the exertion against a cooling air. I'm home, where I shall sit warmly and wish it will all remain as I remember it, for another day. I never tire of snow. Henry Tegner's daughter Veronica Heath carried on his country diary traditions and wrote for the Guardian for 35 years. In one of her last postings she recalled 6 of her personal favourites. For me, reading Henry Tegner's simple description of the silence of snow, did what all good country writing aspires to do, to simply transports memories into a clear view, the natural elements, the suggestion to a spirit of place. 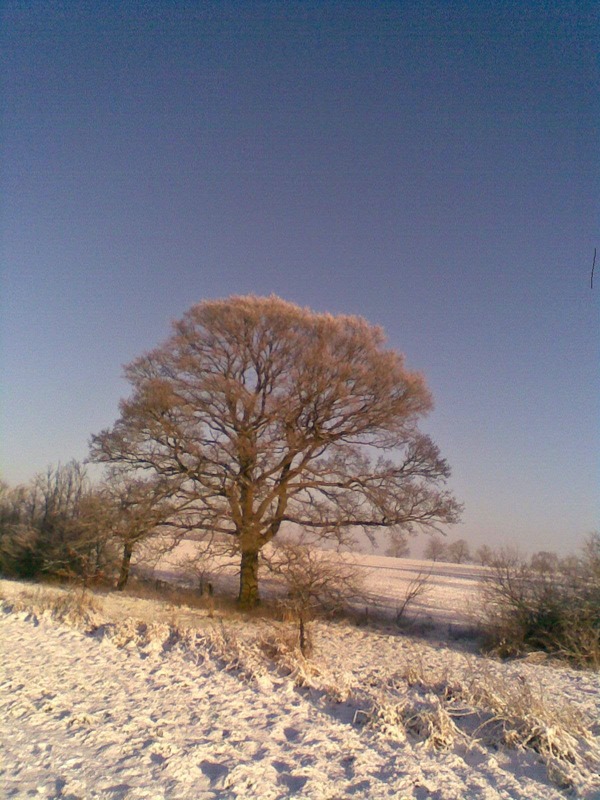 Julie's Tree, Wilton, Wiltshire, 2011. "As evening fell, and the owls began to hoot, I would hear and see starling flocks wheeling about overhead in a sort of tribal dance which went on until sundown, when one by one the black birds would drop like stones into the tall straggling thorns above me and there continue their deafening chatter for a while." In this article, BB also mentions starlings coming to a city roost, presumably for warmth. This stirred a memory in me that has remained vivid for over 40 years. As a child away from schooling, my winters were a mixture of semi rural living and, especially as Christmas approached, city shopping. I lived in a large rambling late Victorian terrace house which for reasons never fully explained sat incongruously as a pale monolith comprising 4 white terrace houses amidst a surrounding green sea of farmland, market gardens, a spectacularly spooky rural cemetery and a golf course (my bedroom overlooked the first green). As a child I had a vast playground on my doorstep, yet this was a mere 7 miles from the bright light city bustle of Newcastle Upon Tyne. Newcastle today is magical regeneration city, yet back then, and I'm referring to the early 1970's, my visits to Newcastle on a winter's afternoon were thrilling for another reason. The lights, the noise, the hubbub of city folk, the shop windows - and above all of that - as dusk fell, the starlings. As we trudged up Northumberland Street or down Clayton Street, above us the deafening roar of many many thousands of starlings echoed around the man-made canyon we trod. Like their human counterparts heading in the opposite direction, these starlings were commuting into the city from their daytime rural foraging areas to roost. Virtually impossible to count, these black specks jostled and squabbled for the best real estate on the block. Sitting shoulder to shoulder wedged along a ledge they overlooked the human scene far below, reminiscent of monks in their dark robes gathered for vespers. And, like any religious evensong, only turning their heads to sing or call. Every imaginable ledge, every roof space and every archway played domicile to the developing cacophony of the sociable starling. I can still remember as a child hearing their chattering above the humanitarian sounds from the street, before almost imperceptibly the birds fell silent and the cityscape sounds dominated once more. Christmas shopping and dodging starling droppings in a noisy man made landscape are forever interlinked. Sadly now the starlings are prevented from roosting in Newcastle and are to be found in a wilder landscape to roost. It was a rural landscape that I found myself in yesterday, the Somerset Levels to be precise. The Levels are well known for their starling murmurations at dusk, an atmospheric ballet as thousands come in to roost amongst the reeds. Thanks to a lot of coverage by the media, especially television, the winter weekends down on the Levels can be as busy as any high street awash with the festive shopper. However I'd not come to see this, I trod a careful path along the reserve well before dawn in almost pitch darkness. I'd come to see the starlings take off. This was a first for me, and for Julie, who joined me. I'd seen and heard this dawn spectacle many times from a distance, via sound recordings or secondhand encounters with other naturalists. But, I'm ashamed to say that even though I am generally an early riser anyway, I'd not made the effort before to leave the house at 5am to witness this myself, a mere 25 minutes drive away. Today was that day. The night before Julie and I agreed we'd push the boat out and be ready to leave sharp at 5am. As it happened we were so excited that by 3am we were both chatting away while having breakfast and making the obligatory flask of coffee. Dawn vigils are such a thrill but one thing I have discovered is that one can get cold very quickly - strong coffee is always a godsend. Two other people were at the reserve but that was it, and just before 6.30am we were in position, alone in the world and looking out over a serene half light. To the east the morning light was already renting the dark horizon providing enough illumination to reflect on the calm scene in front of us. Small groups of wigeon wheezed overhead. Not a breath of wind stirred the water which, mirror like, provided a stunning backdrop to the land, sky and a small party of mute swans at leisure before dawn. A tawny owl hooted in the far distance, and a kingfisher piped its alarm behind, but that was all, near silence. Was that a low chattering sound floating over the surface towards us? It was almost impossible to hear. I listened intently, yes that's them. Turning to Julie I told her to listen, she could hear them too. They'd started. And so had the mist. Patchy mist had dogged our journey to the Levels but on arrival the moonlight was strong over the landscape. As often happens however the arrival of dawn moves the sleeping atmosphere and like a spectral being, thick mist emerged from the lake adding atmosphere to an already emotional view. We moved position slightly to be nearer the centre of the sound and as we did so the calls of possibly 100,000 starlings grew from a wall of noise to thousands of individual birds, each note jostling for dominance with its neighbour. It was time for a coffee and to sit with half a dozen other people at the viewpoint and wait. 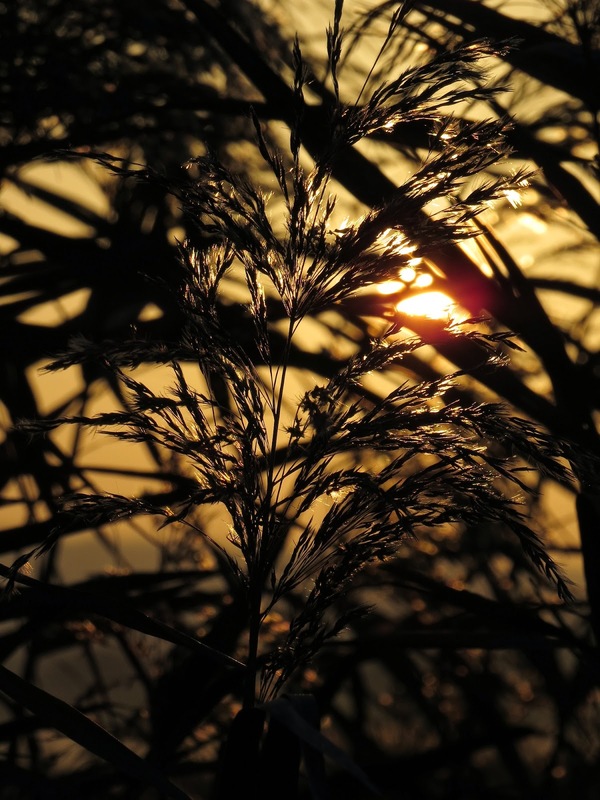 On, on came the noise, wave after wave of tumultuous chorus echoed around the reed bed. Soon small parties of starlings began to hedge hop, or should that be reed hop from one area to another, never high enough to arise suspicion by any passing predator. Soon the pitch and notes began to change, they were getting ready for that mass lift off which some nature writers have described as an express train passing close by. It was quite light now, after 7am, yet mist made it difficult to see what was happening. We had to focus on the noise, now pulsing through the reeds, intermingled with the odd higher pitch. Was this the starling commander blowing his whistle? "Come on chaps, over the top, last one to Westhay buys the drinks"
The noise was deafening, we humans were dwarfed by the sound just metres in front of us. And then it went quiet. The roar that followed took us all by surprise. This was no express train but a sound resembling a huge storm wave hitting a shingle shore. It alerted us to a massed lift off. To our left, following some unknown signal, starlings erupted individually from the reeds at speed, but viewed en-mass as if in slow motion, like a black powder cloud billowing over the battlefield. So dense was this cloud it obliterated everything beyond it. Seconds later another roar just beyond, another eruption of black, yet another behind that, a third wave. 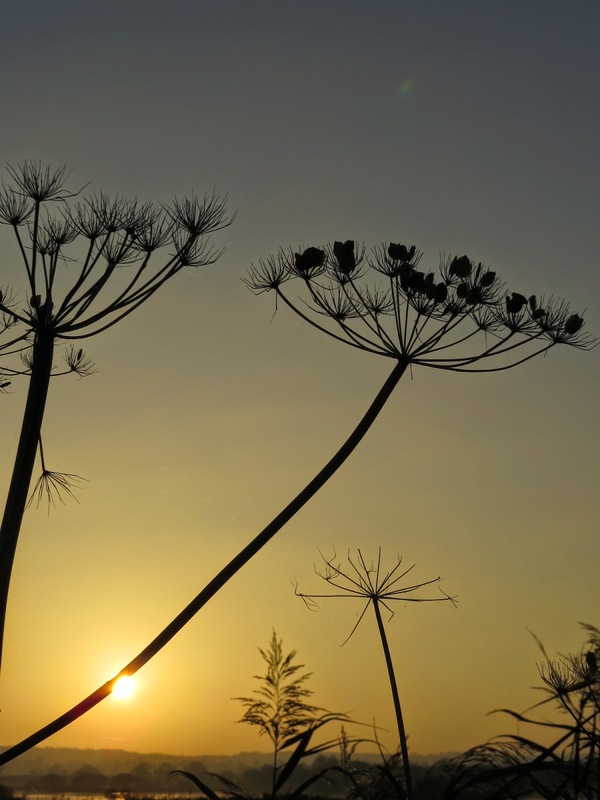 The air was filled with life, a kaleidoscope of black spiralled across the dawn sky, over the reeds in formation. Individual birds making a break for the opposite side of the open water, joined by their comrades. It was 7.13am. In the mist this break of cover resembled the creation of a physical bridge from reedbed to reedbed. So many birds flew over this area that for nearly 5 minutes the bridge existed where it had not existed before. As the front troops crossed and dropped into cover beyond, more flew in behind and joined them. A colossus of movement, an amorphous mass of wingbeats, the place was alive with pulsating black powder billowing in form. The last troops safely over the bridge disappeared but the whole were now held within the reeds to the left. Squabbling, rising, half-heartedly making breaks for open cover, the confusion of these starling battalions seemed palpable. A loose group broke cover as a black river began to surge along a hedge line and away towards the Mendip Hills. Another river flowed to the south between some trees and before too long the whole landscape in front of us stopped moving and fell silent. It was 7.20am and the sun was just breaking the skyline and a lone female marsh harrier quartered the reeds for the walking wounded. The now empty landscape was still beautiful, still there, we had connected for a few short minutes to one of nature's unparalleled spectacles. Retracing our steps back to the car the landscape was bathed in a soft buttermilk glow of a November morning. The mist had lifted and other birdwatchers bristling with optics were now arriving to observe the reserves' other birds in daylight. Had we just witnessed something that has happened for centuries across Britain? Did those who in ancient times walked the Sweettrack across this marsh witness the black cloud during their hunting trips? Presumably yes although we don't know the population of starlings back then. As a child the starlings of Newcastle were part of what made me follow a path into nature conservation, a drip-drip of many wildlife encounters that got under my skin. I didn't need equipment then to feel the force of nature, and yesterday I didn't need equipment to see the sight before me, I felt it, we felt it, we certainly heard it and above all that handful of people in amongst the reeds connected with the power nature can awaken and stir in the primeval imaginations within all of us. I may have been fifty years old when I saw this for the first time but I'll remember it until my last breath. BB was correct when he said "...one moment there is not one in sight, the next you have a black mass, resembling a horde of shiny beetles*". Today I saw that too, but in reverse. Sadly people of Newcastle are no longer able to relive my naturalist awakening by the starling as I once did. *'Amid the Tangled Thorns' from The Naturalist's Bedside Book by BB, published 1980. I had the absolute privilege of working with a visually impaired photographer on Sunday, up at Hadrian's Wall in Northumberland. Rosita McKenzie was one of the most inspiring people I have met. At the age of 11 she became blind almost overnight and now has absolutely no visual stimuli, although as she said she may be able to distinguish between bright sunlight and dark night, but now not sure whether that's just because it 'feels different'. She came to Hadrian's Wall with me to record a short programme which will air in February on Radio 4. More on that nearer the time. What I came away with was a real understanding of her disability, her work and her way of connecting with the landscape. I'll come back to this topic soon, but as this is Armistice Day, she mentioned to me when we met she had just returned from visiting the poppies at the Tower of London. Wishing to take a photograph which represented what she felt about her visit there, rather than just an image of a poppy, she had the scene described to her by one of the stewards. 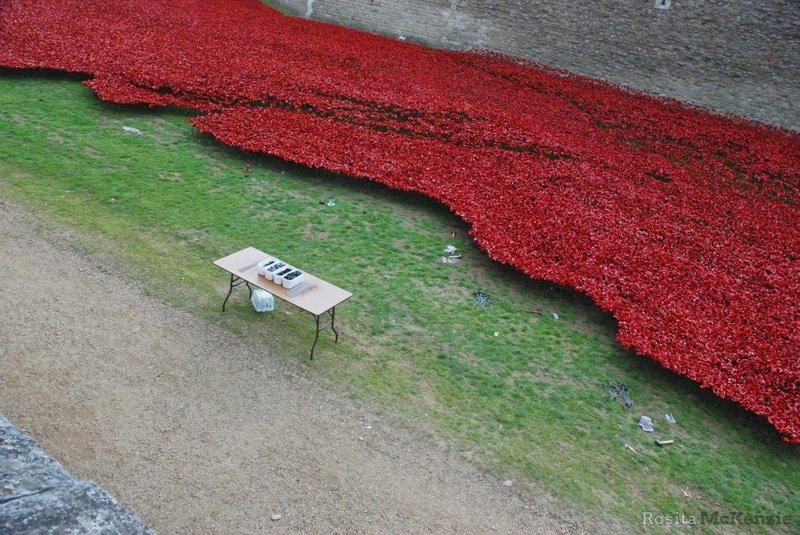 The steward mentioned that she was looking at one of the workers tables, complete with abandoned tools and water, adjacent to the sea of poppies. "That's it, that's the image I want to take"
Rosita's inspiration for that image was her imagination and connection to the scene around her. Her connection was that these modern tools were as it were a ghost presence of the tools of war left by the troops who died on the battlefield. Those tools of different use 100 years apart were at some point in time held by living breathing people. 100 years ago that rifle, bayonet or helmet was a tool of a now long dead soldier, today at the tower, the workers tools are similarly abandoned, only the memory of the living breathing human beings who held either set of tools remains. But what she grasped was the human endeavour, now surrounded by poppies via an image which she captured above. And I think this is the most poignant image I've seen in context of its reason for capture. I wonder how many people visiting the sea of poppies, especially sighted people thought in that way. How many grumbled at the fact that 'that table is spoiling my view'. In the short time I spent in Rosita's company, I learnt a lot about myself, about connecting with the landscape and about how someone who is visually impaired sees with much more clarity than I ever could. Rosita is a remarkable woman and I am privileged to have met her. The writer, commentator and inspirational thinker Richard Jefferies is a bedrock for anyone who is attuned to 'Spirit of Place' nature writing and environmentalism. So it was that yesterday as a Trustee of the recently formed Richard Jefferies Museum Trust, I attended a Sustainability Self-Assessment Framework meeting. Distilling down the jargon, this process allowed the Trustees and Management team to realistically assess where the Museum has come in the first 12 months of its phoenix like rebirth, assess our structure and process thus allowing a recognised and agreed benchmark to work towards in the future. Expertly chaired by Liz (a Museums Development Officer for the South West Museums Sustainability Programme) this was the second meeting and as a Trustee I found this thoroughly insightful and stimulating. It is hard to think that only a couple of years ago the Museum was threatened with closure, the property would likely have been sold off and that would have been the end of road for Jefferies' birthplace. Two days of discussion really has put down the seeds of sustainable development which following peer to peer review can provide a solid foundation as the Museum moves forward. I'd taken 2 days annual leave to attend this meeting and although we pushed ourselves hard, we allowed ourselves half an hour for lunch. 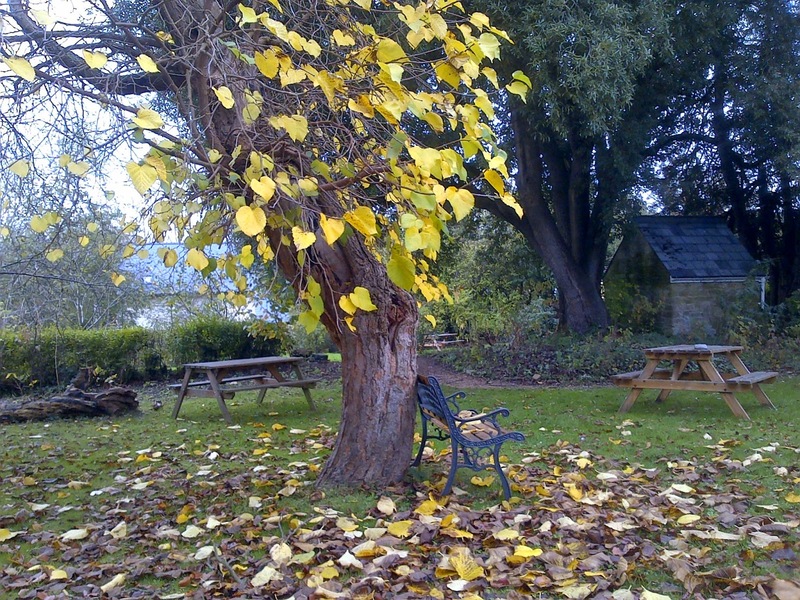 As the Museum is currently closed for the winter, I wandered into the garden and sat by The Mulberry Tree, now shedding its leaves rapidly as the November chill gathers around its fissured trunk. This is not just any mulberry tree, but a mulberry tree thought to be close to 180 years old and planted by Richard Jefferies father, James Luckett Jefferies. James inherited the 40 acre farm in 1825 and my imagination as I sat there wandered through the thought that maybe the tree could have been planted as a 10th anniversary of their time here; possibly a celebration to a successful few years as farmers. But that is pure speculation on my part. What is known is that by the time Richard Jefferies himself was a child, the tree would have been around 20 to 30 years old and presumably bearing fruit, something it still does today. I sat quietly having lunch, watching the odd leaf listlessly fall onto the lawn as only leaves can do in November. It then struck me that although I am seeing a part of the landscape Jefferies himself saw and intimately knew, in reality I am not seeing what he saw, but a relic of that image. Jefferies the child would have seen a young tree, full of vigour, life, energy maturing slowly as he too matured as a young man forming and gathering his ideas on nature and the countryside. Today I looked upon Jefferies’ tree, its remaining heart shaped leaves citrus shimmering in a weak November sun, but it is a tree in its more mature phase. It is beautiful yes, but battered and bruised by its endurance over a long life. Yet for me it provides a direct link to that ‘Spirit of Place’ Jefferies' writing encapsulates. Mulberry trees are prone to fall over or lose limbs as they grow to maturity. And Jefferies’ mulberry is no exception. 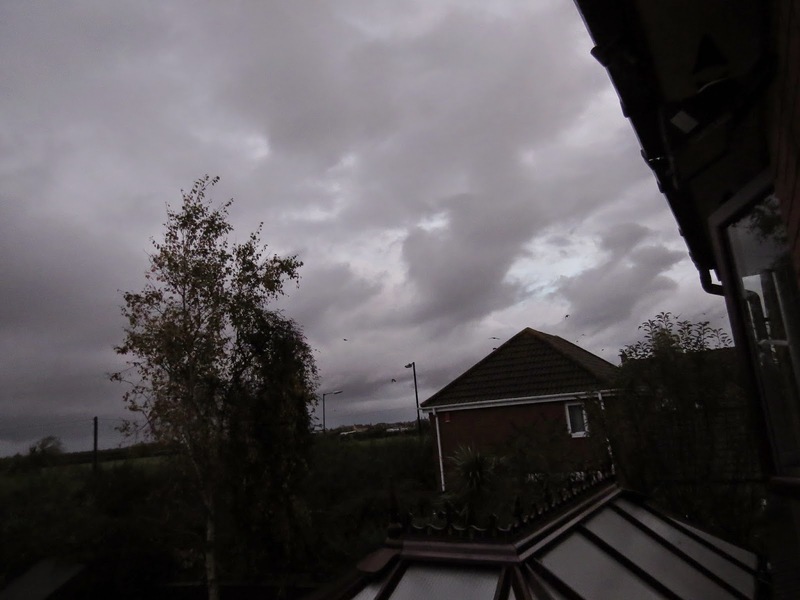 In the morning of September 23rd 2007, gales blew across Central England and the tree split in two, losing a main branch. Whilst sad aesthetically, this is natural in many species of tree as they mature and will not affect their lifespan. Indeed mulberry trees often fall over onto the ground and sucker. That fallen branch lying across the lawn in 2007, had it not been cleared away but left in situ, would undoubtedly have suckered from where it touched the earth, thereby rejuvenating and strengthening its presence by 'walking' youthful like across a garden landscape. Many trees do this, the common lime especially. 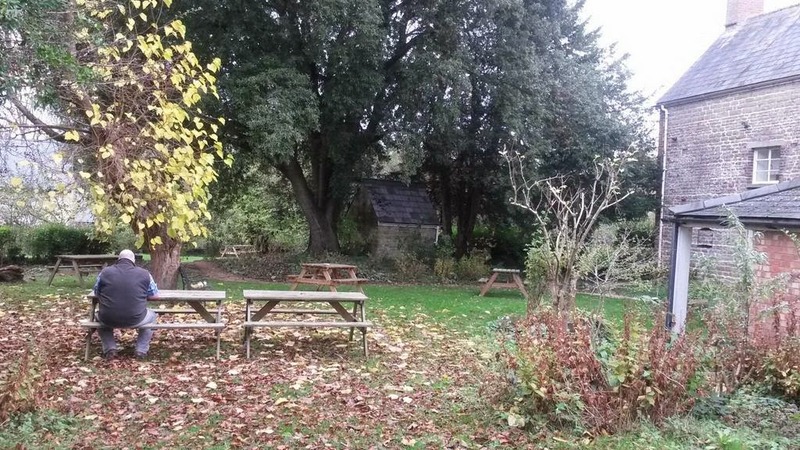 What is known is that Jefferies regularly sat under this tree during his time here, and unusually (as he was not known to be a prolific poet) composed a poem entitled The Tree Of Life, which when it was published on November 8th 1890 (three years after his death) went under the title of The Mulberry Tree. ﻿﻿I gazed upon the tree before me, like Jefferies undoubtedly did, lost in thought that like Jefferies writing, like the concept of Spirit of Place, through time, as the years go by, ghosts of those who trod lightly echo within the imagination. Their presence seeps into our very body and soul to create a moment, a moment that in the blink of an eye, is gone. Rising, I trod lightly myself around the tree gathering leaves for no other reason than it felt the right thing to do, to gather a part of Jefferies' to take away with me and to gaze upon over time. As I write, I have those leaves beside me; a physical reminder of a moment in thought. I don't expect to win any awards with this sequence of images, but for me they're an important record. I've mentioned a few times that the village jackdaws use the lane at the back of my house as a flight-path. Presumably the delineation between houses and open country is a handsome landmark. They are clockwork in the precision of their movement; 5-7 minutes before sunset and 5 minutes before sunrise they fly by or over the garden. I love this regularity as if I'm in the house I know I can pop outside, say hello and pop back in again. During the week I had experienced these jackdaws flying past almost at fence height at dawn, close enough to hear every wing beat. Since then they've been slightly higher as they pass, but only to house roof height. They do move about a bit as they pass, sometimes high, sometimes over the field, and sometimes as happened in September, so close to the house (between the silver birch and the house, which is 20 feet) I'm sure I could have touched them. Do they know I wait in anticipation and come to say hello I wonder? This morning they began streaming past at exactly 7am, (sunrise today = 07.05 hrs), and it was raining, dull and very windy. I'd been up since 4am anyway and observing the weather felt it pointless getting the sound recording kit out. I hatched a plan for the camera. I've begun using the camera's sports mode for flying birds, 10 images in 1.5 seconds. Great for capturing movement (a video would do that of course but I like a challenge). The downside to this is I have to use the camera pre-settings so, like today, being dark as the jackdaws flew, the images are grainy and dark too. Yet they set the scene, I can see the birds coming and the click click click manages somehow to convey their passing. They passed in 4 waves today, each wave of around 20-40 jackdaws interspersed with around 30 seconds to 1 minute of inactivity, so within 4 minutes they'd all passed by. I could hear other jackdaws behind me so the groups had presumably split as they passed by. On rare occasions it seems the whole flock fly by, which at the moment is in the low hundreds of birds, rare occasions indeed. Over the next 15 minutes or so the rooks which accompany jackdaws on their foraging days follow the same flight-path, although in small groups and less predictable. Single pairs of jackdaws also fly by too (could I suggest teenagers unwilling to get up?). For the corvid watcher, manna from heaven, and I don't even have to leave the house. Now I shall wait until around 4.45pm and enjoy their return from a days foraging. Plenty time for breakfast.